I just got a few album samples in and wanted show off their awesomeness! I got a bunch of different sizes so you can really tell the big differences between them because often what we think something will be like is far from what it is. The first four are all hinged albums. The biggest difference between hinged and flush is that the flush pages are printed on a thick photo paper but them mounted to a board which gives it a very small gutter (center of the book). You can still have photos span across the spread on a hinged book but the gutter is a tiny bit larger which you should be able to see from the photos. The hinged books are not mounted to a board, but printed on pretty thick paper and they lay pretty nice unlike a “magazine style” where the pages are stuffed into the center of the book and you lose a lot of your image. We do offer leather and fabric options for covers on the hinged books but my favorite are the photo covers and print covers. This first set of images is just to show you the difference in size between them all. 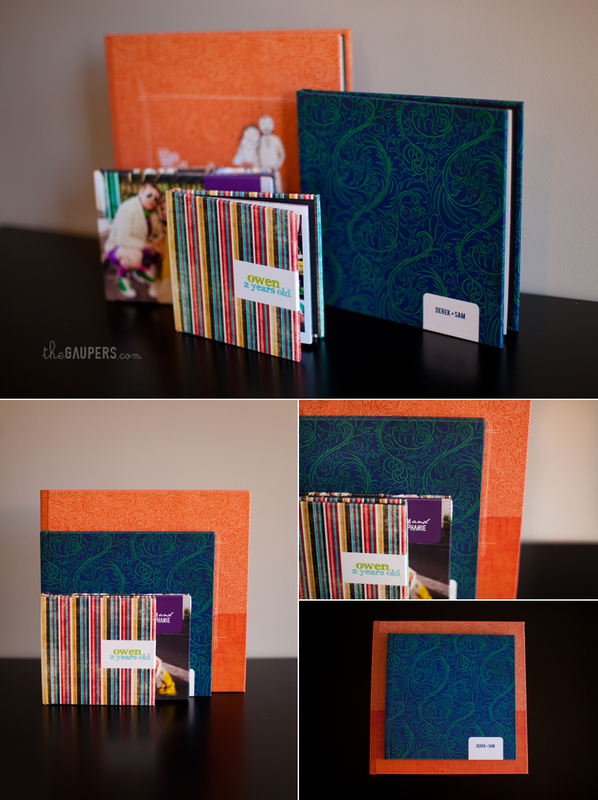 The orange book is a 10×10, the blue swirl book is an 8×8, the small rectangle one is a 5×7 and the front square is a 5×5. This little 5×7 album really surprised me. In my mind a 5×7 seems awfully small but this is a wonderful little size. The photos are certainly big enough and for this type of a session, it’s just perfect. This is a “dirt don’t hurt” session which is our take on a “trash the dress” session. It’s just fun and whimsical so a small book like this is just perfect. The cover is also my favorite of all of them. I just can’t get enough of the color! This is the 8×8 which also surprised me which was a great size it was. This is perfect for an engagement book or a guest book. In this sample, it’s an engagement book. They are having a peacock themed wedding so this solid printed cover was the perfect choice. It’s simple but still makes a statement because of the bold print. The photo below it illustrates the hinge in the book the best. 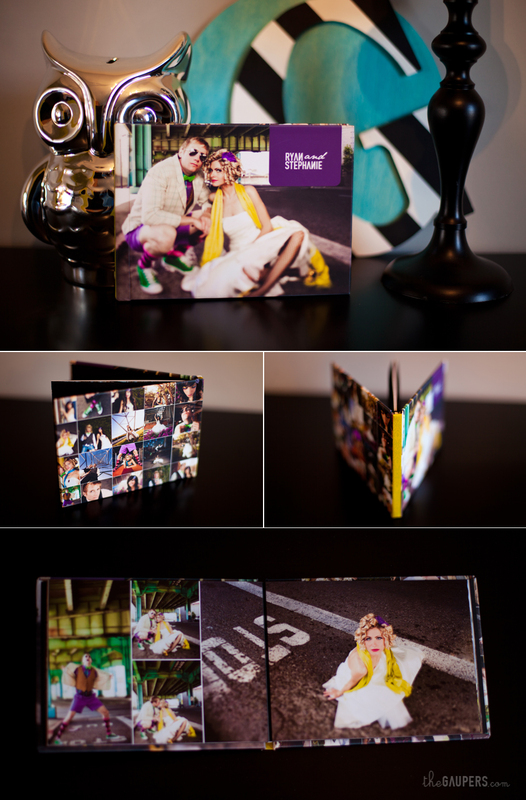 This is a 10×10 wedding album. The printed covers are so great when you have a good “brand” to your wedding. Just by looking at the cover, you have probably developed ideas about who these people are and I love that. 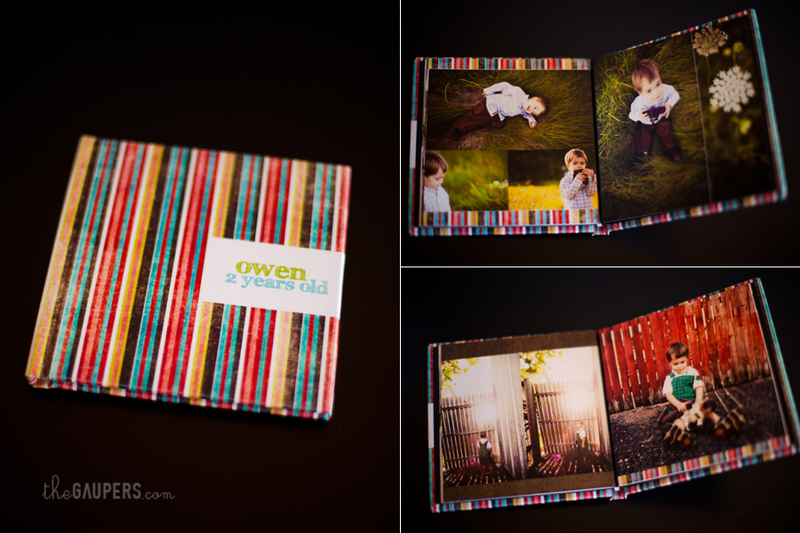 …and this little guy is a 5×5 album of Owen! When I knew I wanted to get a 5×5 sample I knew right away it would be of him since he is also tiny. I like this because it’s nice and small and cute and if you did photos every year of your child, it would be adorable to have a little 5×5 collection of their first years. Ok This is the big daddy of all the albums! The flush mount. I completely understand that wedding albums can be expensive and if your purchasing it a la carte or after the fact you may not be understanding it’s worth. When your hire a photographer, your trusting in their creative skill, their professionalism, their ability to have a vision for your day and carry that out. Your looking for images that tell the story of your day so you can always remember it in the best light. So why wouldn’t you put a top of the line album in your budget? It is the final piece to the vision and is what will stay in your family forever. This is the one physical item that holds the memories of your wedding and what will be passed down to your kids. 20 years from now, dvd’s may break or get lost or they might not even be the standard of what we use. Do you remember zip drives? Those used to be a big deal too haha. 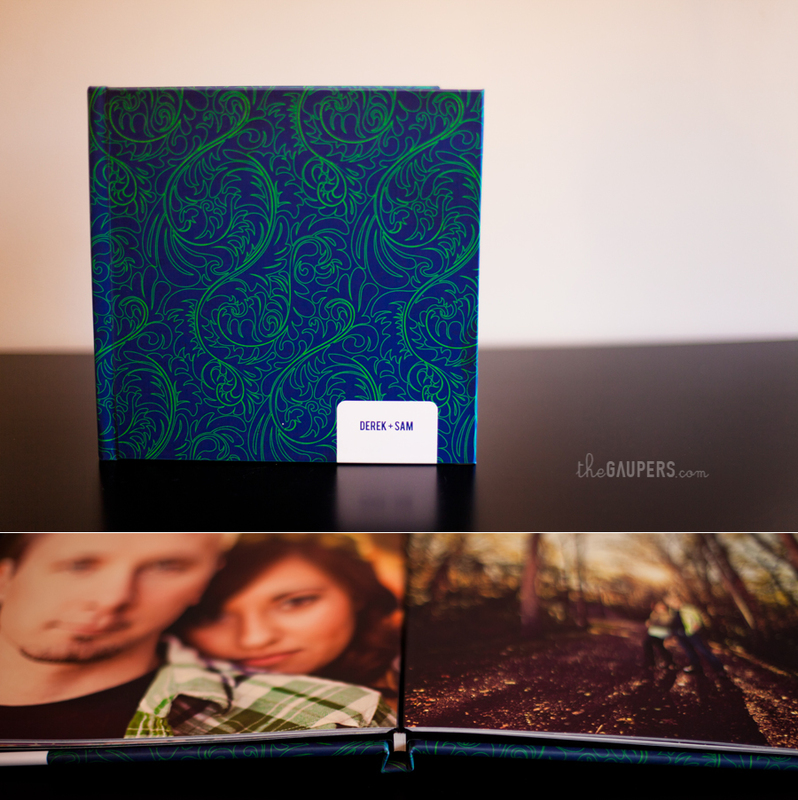 A wedding album isn’t something you will lose, isn’t something that will go out of style. It’s timeless. Everything has gone so digital that important things are getting lost and looked over. 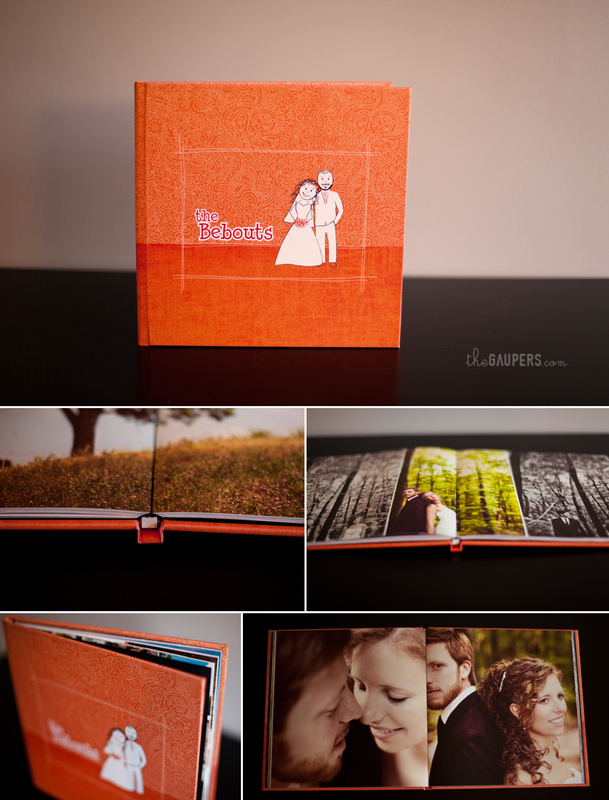 Valuable things like wedding albums. Yes, technology is awesome and I’m certainly a fan, but I believe that some things must remain sacred and a great wedding album is one of them. Some of you may say, “I get it Holly, but I really can’t afford it” and I understand that but do challenge you to look at other things your spending your money on with your wedding if your on a budget. Weight their value. Even if you simply cannot pre-purchase an album, I will always still be an advocate hiring a great photographer and then saving up for the album later if you simply can’t swing it before. Logically, there is just one day, one chance, to get amazing photos. You have all the time you need to save up for an album. There is no point to hiring a super cheap photographer who doesn’t do work you love just because their “package” includes and album and fits within your current budget. Whats the point of having that album forever if it’s full of photos you don’t love? If you have no other options financially, hire the photographer you love, get photos you’ll love forever and make it a part of your monthly budget to save a certain amount towards and amazing album afterwards. Ok so with all that said…here is a 10×10 flush mount with a polished crocodile bone leather cover. This book also comes in a really nice leather box as well. I didn’t take photos of it, but the hinged books come in a hard dark brown box. Since many of our clients are not local, I hope this helps to get an idea of what our albums are like. If you have any questions at all please let me know! If you are not a wedding client of ours or already married but never got an album, I do album design work for anyone and everyone because I’m such a firm believer in the fact that it’s never too late to get one made!